Feedback is hard. Giving it, receiving it, absorbing it, acting on it — all of these things require openness and a willingness to communicate honestly. But whether we’re talking about our personal relationships, our professional lives, or society itself, dealing with feedback is essential if we want to meet our goals, grow, and improve. In Episode 3 of our new podcast, we look at feedback in two forms. 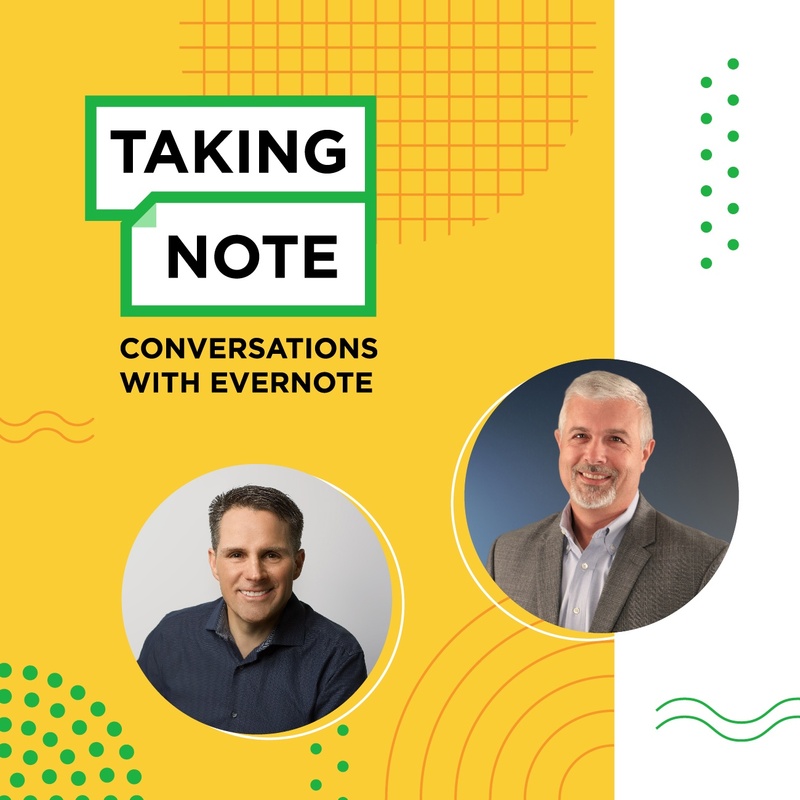 First, we chat with Gerald Hastie, Evernote’s Director of Customer Experience, to learn more about how Evernote’s customer support and Help Center are working to address feedback from the public. 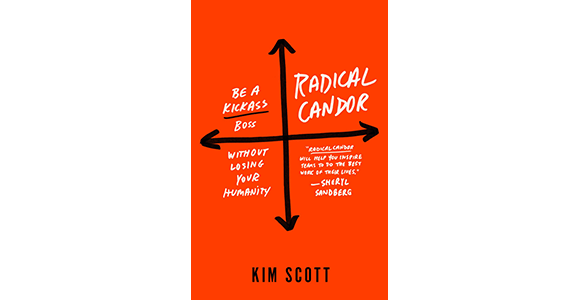 Then we sit down with Kim Scott, author of the new book Radical Candor: Be a Kickass Boss without Losing your Humanity, to learn how building a culture of candor at work can help us all become more effective in whatever we do. 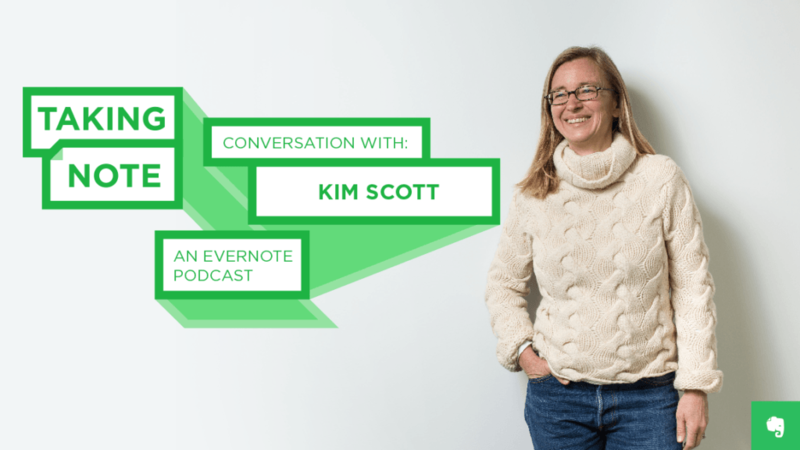 Highlights of our conversation with Kim Scott are transcribed below. 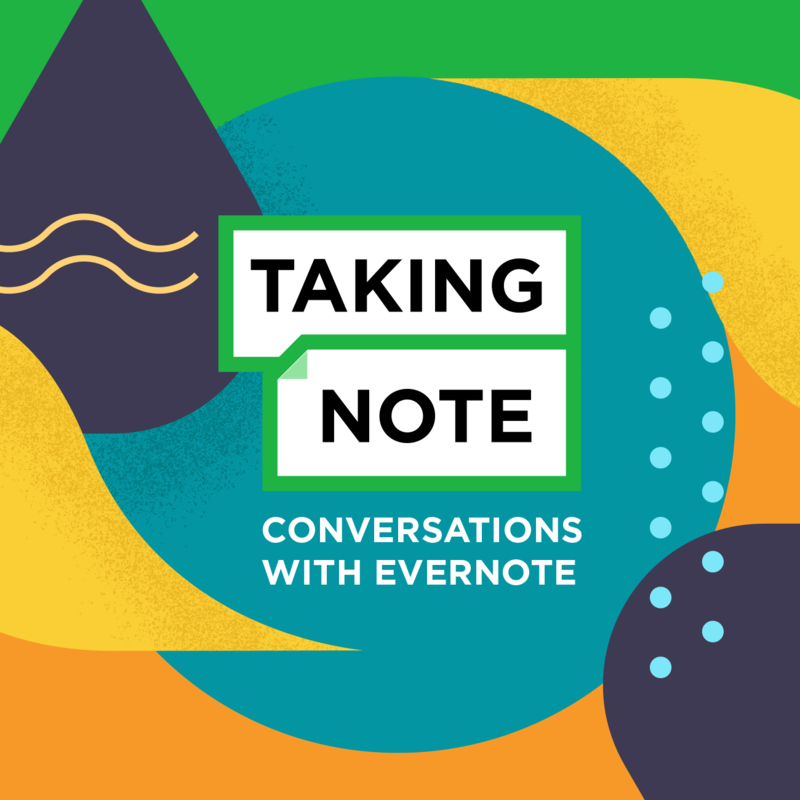 To hear the complete interview and subscribe to future episodes of “Taking Note,” head over to iTunes, SoundCloud, or Google Play. You’ve talked about the universality of some of the issues that you see [working with CEOs]. What are some of the things that come up most frequently? I think one of the things that people struggle with most is how to create a culture of feedback. Part of the problem is that you know as a manager that you’re supposed to give feedback. That’s very nerve-wracking, for two reasons. From the time most of us learn to speak, we had one or two parents who told us some version of “if you don’t have anything nice to say, don’t say it at all.” We’ve been trained since we were 18 months old not to give feedback and now all of a sudden it’s your job to do it. We’ve been trained since we were 18 months old not to give feedback and now all of a sudden it’s your job to do it. I think the other part of the problem is that around the time we’re 18 years old, we get told be “professional.” For too many people that gets translated to mean leave all of your vulnerabilities, leave all of your emotions, leave your humanity, the very best part of yourself, at home and come to work like some kind of robot. Both of those factors combine to make giving feedback really hard. They also combine to make leaders forget that they’re actually supposed to solicit it before they start giving it. Don’t dish it out until you prove you can take it. I know your work with Sheryl Sandberg, when she was with Google, was key to the development of your approach and your thinking in these terms. What’s the story there? Shortly after I joined Google, I had to give a presentation to the CEO and the founders about the AdSense business. When I walked into the presentation, I felt a little nervous like any normal person would in that situation. The good news, however, was that the business was on fire. When I said how many new customers we had added over the last month or so, Eric Schmidt, the CEO, sort of jerked his head up out of his computer and said, “What did you say? What resources do you need to keep this business miracle alive? Do you need more engineers? Do you need marketing dollars?” I felt like the meeting had gone pretty well. In fact, I felt like a genius. As I was leaving the meeting, I passed by Sheryl Sandberg, my boss, and I was expecting a high-five or some sort of congrats. Instead, she said, “Why don’t you walk back to my office with me?” I thought, oh boy, I did something wrong. I’m sure I’m about to hear about it. Now, a lot of people would have said that it was mean of Sheryl to say that I sounded stupid, but in fact, it was the very kindest thing she could have done for me. It was what she had to do in order to get through to me. The reason why it was such a kindness was that when I went to see the speech coach, I learned that she really wasn’t exaggerating. I literally did say ‘um’ every third word. The thing that struck me in that moment was that nobody had told me that I had this problem. It was like I had been going through my whole career with a giant hunk of spinach between my teeth and nobody had had the courtesy to tell me about it. Once Sheryl told me about it, I could fix it. Now we’re getting into the concept of Radical Candor, that notion of caring personally and challenging directly. We hear a lot of talk about constructive criticism, but ‘constructive’ is a very cold word. I think when you talk about caring personally, that makes it a bit more immediate. Is there a difference between constructive criticism and Radical Candor? Yes. I’m really glad you raised the question of constructive criticism because it’s a bugaboo of mine. One of the problems with the term ‘constructive criticism’ is that it implies that you can control how the other person reacts to what you say. There’s a big difference between Radical Candor and obnoxious aggression. 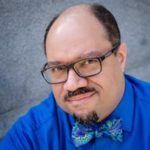 The big difference between Radical Candor and constructive criticism is that Radical Candor, first of all, applies to both praise and criticism, and caring personally is about acknowledging the other person as an independent human being. If they do get upset, it’s about reacting to that upset with compassion, not imagining that if you just found the right words they wouldn’t get upset. Again, Radical Candor is caring personally and challenging directly at the same time. There’s a big difference between Radical Candor and obnoxious aggression. There’s a very simple and direct visualization of this that you use a lot where Radical Candor is one quadrant of a graph. Could you walk us through those four quadrants? It explains what happens when you have both the caring personally and challenging directly when you lack one or the other and when you have neither. 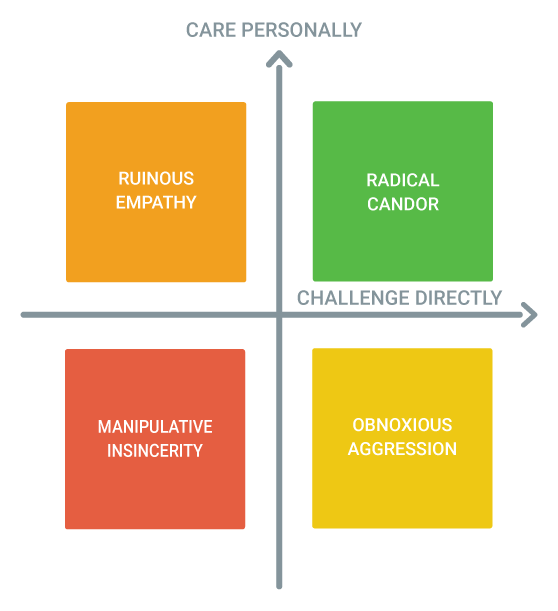 When you care personally and challenge directly, that’s Radical Candor. When you challenge directly but fail to show that you care personally, that’s obnoxious aggression. When you care personally but you fail to challenge directly, that’s ruinous empathy, and when you fail on both dimensions, which we all do from time to time, it’s what I call manipulative insincerity. When we get so busy or so stressed or so reactive that we fail to show that we care personally and don’t bother to challenge directly, that’s where really insidious behavior, political behavior, office politics comes in, passive aggressive behavior. These are strong words: “ruinous” and “obnoxious” and “manipulative,” but you’re not kidding. There are real imp lications to failing to achieve Radical Candor, right? What are some of the things that happen to organizations which miss the mark? The most common mistake that I see made in organizations is ruinous empathy where people really do care about one another; they don’t want to hurt each other’s feelings. Therefore, when somebody makes a mistake, when work isn’t nearly good enough, they fail to say so. Also, when they offer praise to people, they offer praise in a way that is aimed at bolstering their ego or just making them feel better as opposed to showing what was really genuinely great. In those cultures of ruinous empathy, people don’t do the best work of their lives. It’s impossible for a person to see in the moment when they’re making a mistake. We rely on each other to show us when we’re making a mistake. When we don’t provide that service to one another, then we don’t do our best work. It’s a shame. It’s a lost opportunity. Part of the reason why I named each of these quadrants so flamboyantly is to provide a really strong warning about what happens. You don’t want to ruin your people. I think one of the things that I have found in my coaching that really helps people is to think of your [own] story. What’s a time in your career when you had a boss who told you something that really helped you improve? It’s not just about dealing with problems; it’s about preventing problems. I can see how there could be implications in this, not just in terms of how people are performing but also how a team works together, their productivity or their creativity or their happiness in the workplace. Is that true? Absolutely. When a team of people feels that they can’t tell each other when something’s going wrong, that they can’t say this pixel is not right or this presentation is not right or your idea doesn’t feel quite right, when they repress all that, meetings start to feel like getting stuck in traffic. There’s the meeting before the meeting and the meeting after the meeting. When problems don’t get fixed, life is depressing. Let’s make new mistakes. Let’s really try to make things better. Let’s fix the old mistakes and make new ones together. I think that’s also when we start to see offices devolve into politics and passive-aggressive situations. It’s also important to realize very often what happens in office situations or just in any human relationship, really, is somebody will cross the line and be a jerk and then the advice that they get is instead of moving up on the “care personally” dimension, they just back off their challenge. This happens all the time, the false apology. It’s happened to me. I’m sure it’s happened to you. It seems safer just to remain silent, but it’s not safe. It’s depressing. If you can force yourself not to back off your challenge when you realize you’ve been a jerk, but instead to react with compassion to the other person’s emotions, then I think we can avoid the passive-aggressive kind of behavior. It seems safer just to remain silent, but it’s not safe. It’s depressing. Do you find anyone takes to this naturally? Are there certain personality types that are more responsive to it? I think that for the vast majority of people it’s hard. It’s definitely hard. It’s tempting to say that some cultures are naturally Radically Candid. Certainly, Radical Candor looks very different in Tel Aviv than it does in Tokyo. Sometimes people think that it’s harder if you come from a polite culture. Often when I’ll talk to a team of Brits they’ll say, “It’s much harder for us,” but in fact, I don’t find that to be the case. I think that everybody struggles to find the right way to say something to another person. I’m also curious if there are any special considerations or nuances to the concept when you’re dealing with female leaders. So many people now still have to deal with this double-standard where being forthright and blunt might be considered a positive trait in a male manager and a negative trait in a female manager. It’s hard to be Radically Candid with someone who looks like you. It’s even harder to be Radically Candid with someone who doesn’t look like you regardless of what the dimensions of that not looking like you are. Specifically to the topic of gender, I think if you’re a male boss and you have female direct reports, there’s a good chance that you have a tendency to pull your punches with the women on your team in a way you don’t with the men, to give less feedback or gentler feedback. It’s not because of some sort of deep-seated terrible misogyny. It’s because you want to be a nice guy and you want to be supportive of the women. Just remembering that you need to give women the same kind of feedback that you give the men on your team is really, really helpful. Now, if you’re a woman and you’re being Radically Candid, you’re much more likely to get unjustly accused of obnoxious aggression. This is the “abrasive” problem. This is the “bossy” problem. This is when the name-calling starts. Here’s my advice on that. First of all, it’s important to just recognize it for what it is. There’s a time and a place to reject that feedback. Just put on your tough suit and continue to show that you care personally, but whatever you do, don’t back off your willingness to challenge directly. Because even if you get accused of obnoxious aggression unfairly, that’s actually a better place to be than ruinous empathy or manipulative insincerity, which is where you’re going to wind up if you back off that challenge. Move up on the “care personally” axis but don’t back off your willingness to challenge directly. Also, a word of caution on the caring personally thing. Often women wind up getting asked to do the office housework. There’s a great essay that Virginia Woolf wrote called “The Angel in the House.” She was referring to this Victorian poem about how women have no wants or needs of their own but just there to support the men. It’s a ridiculous poem. Unfortunately what happens sometimes is that women are expected to be the angel in the office. You’ll burn out and be really pissed off if you get sucked into that path. You want to show you care personally, but don’t get sucked into becoming the angel in the office. This is obviously a management concept. But as we talk, this sounds very much like something that isn’t just top-down but something that an entire team might want to adopt or even that might go the opposite way, might go from bottom up. I hate hierarchical language — but it’s got to go up, down and sideways. The first step is to ask for criticism. Not just ask for criticism but demand criticism. As hard as it is to give criticism, it’s also awkward to ask for it. The first step is to ask for criticism. Not just ask for criticism but demand criticism. Then paradoxically you have to embrace the discomfort. It’s awkward for the other person and it’s tempting for them to just say everything’s fine. You’ve got to actually make it more uncomfortable for the person to tell you nothing than to tell you something. Then you’ve got to listen to what is said with the intent to understand it, not to respond, not to get defensive. You’ve really got to manage that tendency to get defensive. Then finally, you’ve got to reward the truth. If somebody points out a problem and you agree it’s a problem, fix it. Tell them that you fixed it. If you disagree that it’s a problem, find whatever that nugget of what they said that you can agree with and then come back to them a couple of days later when you’re definitely calmer, cooler and not defensive and explain. That all makes a lot of sense. [Radical Candor] sounds difficult, but it all makes a lot of sense. It sounds hard but when you start doing it and seeing the results, it’ll start to feel like exercising regularly. It’ll be hard not to do it. You’ll feel gross. It’ll be like brushing your teeth. You’ll feel gross when you don’t do it. NOTE: Kim also spoke about Radical Candor at the SXSW conference last week. 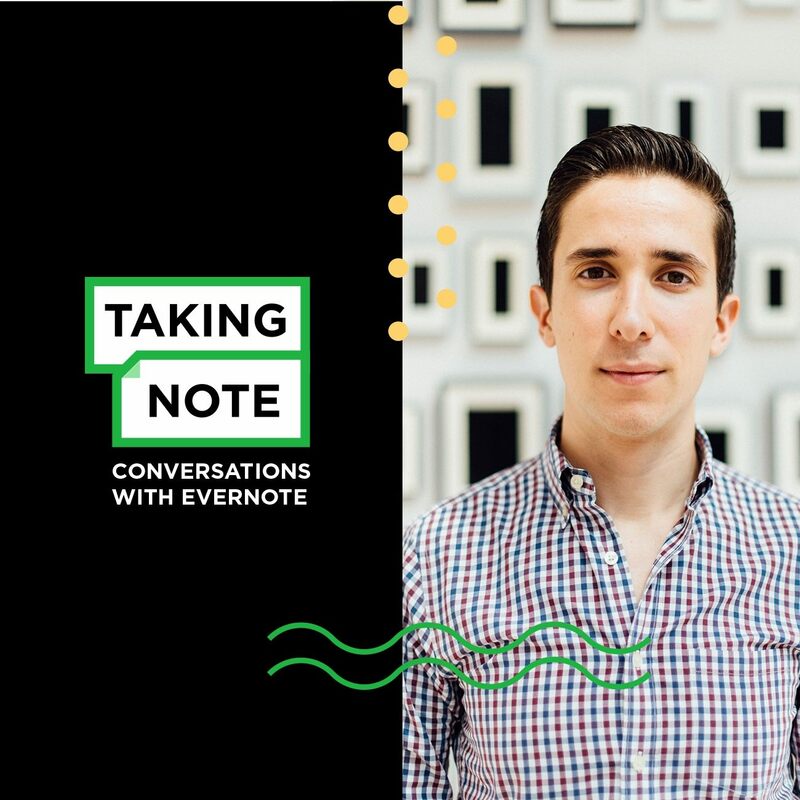 Check out our notes from the SXSW Workplace Track!